On October 26, 2011, the Village of Willowbrook received the Governor’s Home Town Award for History and Historic Preservation. The Village received the award for the community-wide activities that it offered throughout 2010 to celebrate and commemorate its 50th Anniversary. In December 2009, the Village installed 25 banners throughout Willowbrook which displayed the Village’s new logo and the “Commemorate and Celebrate” slogan. The 50th Anniversary celebration was initiated with the Birthday Bash held at the Village Hall, 7760 Quincy Street from 1 to 4 pm. The Birthday Bash included tours of Village Hall, entertainment for children, Cloe the Clown, music, and birthday cakes. Visitors also had a chance to meet current and past Village officials. FOX Chicago News sportscaster Corey McPherrin and meteorologist Tammie Souza were special guests. 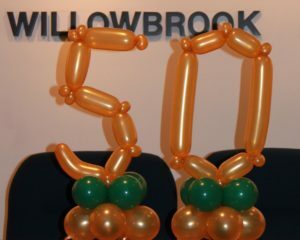 Unique Balloon Decorating decorated the hall with orange and green balloons. Whole Foods and Dominick’s donated birthday cakes, Starbucks donated coffee, and Binny’s Beverage Depot provided soda and water. The second community-wide 50th Anniversary celebration was a Family Fun Day held June 26, 2010 held at Willow Pond, Plainfield and Adams. The day began with a Fun Run at 9:30 am of 1.8 miles from Village Hall to Willow Pond. 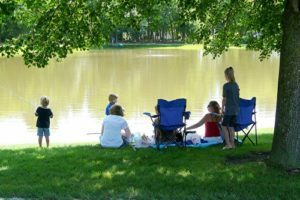 Activities included a free cookout, chess games sponsored by the Willowbrook Chess Club, a Kiwanis’s sponsored bean bag toss, and a fishing derby. At 2 pm the 50th Anniversary Committee buried a time capsule which will not be uncovered until 2035 at Willowbrook’s 75th Anniversary. 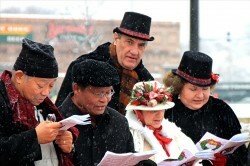 The final event of the year-long anniversary was a Dickens of a Holiday held on December 4, 2010 from 1 to 4 pm at Willowbrook Town Center. Clovers Nursery donated Christmas trees for Willowbrook Town Center. Area school children made ornaments to decorate the trees. On the half hour, carolers from Hinsdale South High School Choir and Madrigal singers, Our Lady of Peace Catholic Church choir, and Our Lady of Mt. Carmel Catholic Church choirs entertained the guests. Many merchants offered coupons, giveaways, and sponsored activities. Lassak Market and Deli, Jimmy John’s and Whole Foods provided treats such as hot apple cider, candy canes, and hot chocolate. A horse drawn carriage took people for rides. Santa Claus set up shop in an empty storefront where residents dropped off food and clothing for the Our Lady of Peace food pantry. Children wrote and mailed their letters to Santa Claus. The day ended with Village President Robert Napoli lighting the Christmas tree at 5 p.m.